I haven’t posted in a while. I’ve been so caught up in what I’ve been reading (a lengthy fantasy trilogy: The Riyria Revelations) that I haven’t been able to (or wanted to) come up for air. It’s a wonderful experience, being so immersed in another world, and one that hasn’t happened in quite some time. I’ve been fortunate to have taken two long car rides the past two weekends, which gave me a lot of time to indulge the obsession. I could not put these books down. 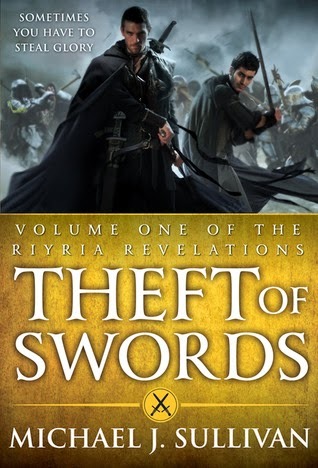 It was more than a year ago, maybe two, that I read a review of Theft of Swords by Michael J. Sullivan over at Confessions of an Avid Reader. Although I don’t read much fantasy, the genre is a cousin in a way to historical fiction so I do read some, and the review stirred my interest. I think it was something about the relationship between the protagonists that caught my eye. I love a good "buddy" adventure with strong male protagonists. So I bought the book. Needing a book for my long car ride and being a little behind on my TBR pile challenge, I decided to bring along Theft of Swords. Wow! Those hours in the car sped by. Not only that, but I had to stop at a bookstore before we set out on the return journey to buy book two of the trilogy (thankfully it was in stock at Barnes and Noble!) and, since book three was also in stock, I bought that too. I turned the last page last night. Now I have the task of three reviews in one. Since I don’t want to put in any spoilers, the reviews will be pretty superficial. Here goes. In Theft of Swords, we meet the heroes, or anti-heroes, of the tales, Royce Melborn and Hadrian Blackwater. Royce is a thief, perhaps the most accomplished thief in the whole empire. He is partnered by Hadrian, a mercenary, a swordsman of unparalleled skill. Royce is an orphan who grew up in bitter poverty and has a very cynical view of the world. He has his own idea of right and wrong and is loyal only to Hadrian and to whoever has recently paid them the most. Hadrian is more of an idealist and has a conscience. He can kill anyone but that doesn’t mean he will. As the book opens, they are engaged in one job that is fairly routine for them, but that is strewn with exciting obstacles to thrill the reader, and one that turns out to have more political consequences than were initially apparent. Immediately after that job is complete, another presents itself. A simple task. Stealing a sword. Unfortunately, as they are stealing the weapon, they are caught in a room with a murdered king and are framed for the assassination. This sets off the adventure. A whirlwind of political intrigue, scheming sorcerers and witches, familial/dynastic betrayals, elves and dwarves, fantastic beasts, ancient lore and prophecies–and Hadrian and Royce have to puzzle and battle their way through it all, relying on their instincts, their unique skills, and each other. They get things wrong along the way, which makes the perils even more threatening, and the book even harder to put down. The conclusion is satisfying but the story is addictive. Rise of Empire is a fairly typical "middle" book for a trilogy. It was the slowest of the three and may be the one with the most world-building and explanations. But these were necessary to put the meat on the bones of the tale. It filled in a lot of Hadrian’s backstory and gave clues to Royce’s backstory as well, although the clues are not subtle. This is not a book that you have to ponder over or read paragraphs multiple times to figure out what you might be missing. It’s escapism and adventure. The line between the good guys and bad guys does keep shifting, but as long as you stick with Hadrian and Royce, you’re on the good side. Again, the adventures keep on coming. The powerful empire is taking over and the kingdom that Royce and Hadrian had helped to save in book one is once again threatened. 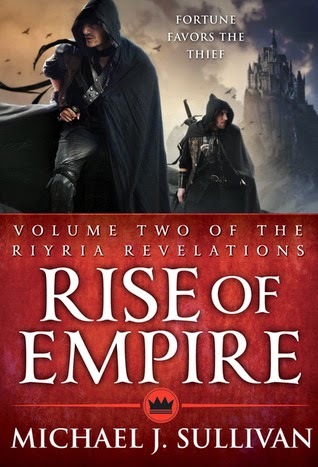 But the empire that's rising is evil and there is more at stake than the kingdom of Melengar, so Royce and Hadrian have their own reasons for taking on the series of tasks that keep the plot flying. Complicating things, and adding to them, are the emotional entanglements. Royce, the cynic, is deeply committed to a woman named Gwen. (She is a seer and, a bit of a cliche, she is a prostitute with a heart of gold.) Between Hadrian and Gwen, Royce’s embittered heart is beginning to soften. And, of course, the reader is rooting for Hadrian to find a love interest also. This book ends with cliffhangers all around, so I barely paused between book two and book three. 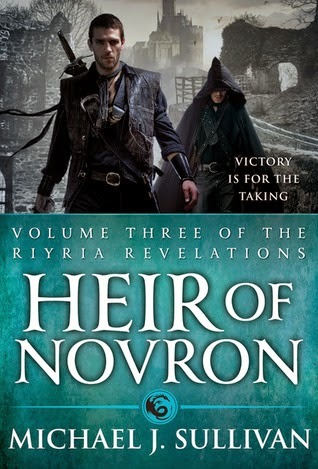 Heir of Novron is the final book. Here, the empire is winning and will mark their victory by putting to death captives who Hadrian and Royce care about (or at least, who Hadrian cares about.) When Hadrian goes to the rescue and is also captured, Royce must make an attempt to rescue Hadrian. We’ve seen them in death defying situations before. We know they’ll get out. The question is how, and the entertainment is in seeing them outwit or outfight their opponents, or in watching them fumble through by doing the unexpected. Or, even being rescued in some unlikely way by an outside force. However, the evil empire isn’t the worst of their problems. The elves are on the march and they are unstoppable. It looks as though the human race is about to be wiped away. The evil lurking behind the empire is the only thing possibly standing in the way of the elves, that and the empress who doesn’t know how to stop them. But the empress has enlisted the help of Hadrian, Royce, a wizardress, and a few others who have aided or been aided by our heroes in past adventures. They have one final impossible task to perform. Is it their destiny to save the world? Or is it all in a days’ work for them? Because as a reader, I was pretty sure the world was in no real danger if they were on the job. But it was a close one. And it makes for vastly entertaining reading. The author has also written a series that is a prequel. When I catch my breath, I’m going to have to read that too. 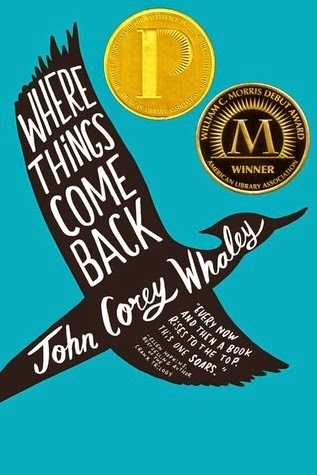 A while back, I was looking for books that YA boys might potentially be interested in and found a recommendation for Where Things Come Back by John Corey Whaley. It’s supposed to be John Green-ish, so I bought the book. I wanted to read it myself and also to have something around as a summer read for my son. That was last year, but my son was heavily into the Game of Thrones books, so this one sat on the shelf. At the bookstore this weekend I noticed that the author has a new book out, Noggin, which looks kind of fun, but I thought I’d better read this one first. Plus, it’s aged on my shelf long enough to count for the TBR pile challenge. Where Things Come Back is a very thoughtful story of seventeen-year-old Cullen Witter’s awful senior-year-of-high-school summer. Cullen lives in Lily, Arkansas, a small town that he describes as a black hole, sucking people back no matter how hard they try to escape. It’s a place where he, at least, fears he will die of boredom. Cullen works at being a pessimist and a cynic. There isn’t much in his life to make him otherwise–and yet, he’s a little embarrassed by a tendency to nevertheless hope for something better. This summer, circumstances seem to conspire to beat out the last bit of optimism Cullen might have left. The summer begins with the death by overdose of his cousin. Cullen attempts to slog on with his routine. A stranger to the town reports the sighting of a known-to-be-extinct woodpecker: the Lazarus Woodpecker, which brings a circus type of celebrity to their small town. Cullen feels as though only he, his younger brother Gabriel, and his best friend Lucas see through the hoax. And then, his brother disappears. A massive search fails to locate him and Cullen’s world slowly dissolves. A second plot revolves around a young missionary whose life is sidetracked after a failed mission to Africa. The one convert he makes, accidentally, is the college roommate he later meets and whose life he influences more than he could possibly envision. As the jacket blurb states (reassures), these plots do intersect. Loose ends are tied. This is a poignant story with likeable protagonists. The characters feel true to life, making it a more or less realistic story even if some of the situations are a bit over the top. If you’re looking for contemporary YA focused on male protagonists, a book that can be read in an afternoon, try Where Things Come Back. Written in 1934, I, Claudius by Robert Graves is considered a masterpiece of historical fiction and has won many awards. However, it’s probably best known nowadays because of the extraordinary BBC television series from 1976. I don’t think I ever watched the whole series from beginning to end. That was back in the day when you had to actually sit down and watch a show when it was on, or else catch the re-run. So I saw episodes out of order at various times when the series was being re-run. Despite never knowing exactly what was going on, it was always riveting. I still intend to watch the whole thing in order someday. But the book has been on my TBR pile for a long time, because, of course, I expected the book to be even better. My verdict is: I think I prefer the T.V. miniseries. I , Claudius is the fictional autobiography of Tiberius Claudius Drusus Nero Germanicus, who, in 41 A.D. became the fourth emperor of Rome. Claudius never wanted to be emperor. He would have preferred that Rome return to the days of the Republic, according to this novel. His own preference was to be a historian. And this novel purports to tell the truth about the early days of the empire. The empire was a hot mess. The power behind the throne was Livia. (The same woman from Phyllis Smith’s wonderful novel, I am Livia.) Being a woman, she couldn’t rule in her own right, so she had to manipulate the men in her life, first Augustus and then her son, Tiberius. In order to ensure that her son (who was not Augustus’s son) would be named emperor, Livia poisoned every male relative that might possibly be a rival. Claudius escaped only because he had a birth defect that left him with a limp. He also stammered and twitched when nervous. Because everyone thought him stupid, no one thought him dangerous and he was able, more or less, to stay out of harm’s way. Claudius relates how the "good" people in the family were all eliminated and the "bad" members thrived–until they, too, were eliminated, usually by the next worse person. This goes on down the line until we get to Caligula, who was literally insane. The amazing thing is that he ruled as long as he did before men brave enough to assassinate him did the deed. 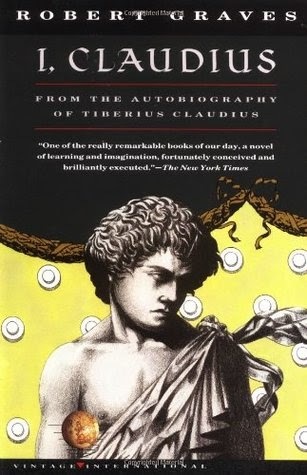 Claudius (Claudius’s voice, given to us by Robert Graves) is a meticulous historian. He is also writing this history a bit as a memoir and given to rambling and digression. So interspersed with entertaining anecdotes and interesting bits of history that move the plot forward are some historical infodumps and other asides that made me feel like the book was never going to end. I usually have much more patience for historical fiction that really delves into the history. And it isn’t a problem with the complexity of Roman history. (I loved Colleen McCullough’s Roman series.) But I think there was just something dry about the delivery of this material. Claudius related everything in a tell-don’t-show fashion. I could admire the characters he told me I should admire. I could be appalled when he told me to be appalled. I could appreciate the subtle humor where he injected it. But I never independently felt anything for the characters. They never came alive for me. It was just one awful tyrant after another doing something horrible. In all honesty, if it hadn’t been for the challenges for the blog, I might have given up on it halfway through, bogged down somewhere in the German wars. So, I’m glad for the challenges, because I would have felt bad giving up on this one. Time for another novel by Georgette Heyer. 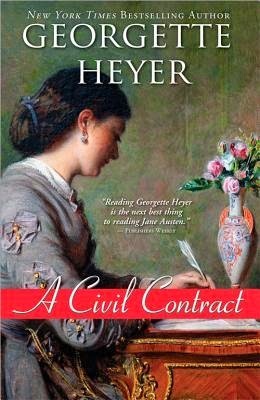 When I want to spend some time with good people while they sort out their love lives, I’ve come to depend on Heyer’s novels. They are sweetly old-fashioned. I know what to expect, more or less, when I pick one up. (Which can be a good thing—I don’t need edge of my seat excitement as long as I’m not bored.) They are always witty and engaging, and simply pleasant to read. In A Civil Contract, the hero is Adam Deveril, now Viscount Lynton since his father has unfortunately died. The father was much loved by society, but he was a terrible gambler who left his family deeply in debt. His son was quite contentedly ignorant of the family finances, doing his duty as Captain Deveril, fighting Napoleon in the waning days of the war (part one.) But Lynton sells his commission and returns home to settle his affairs. He soon realizes he must sell the family estate, Fontley. This is their country home, which he and his sisters love, and the thought of losing it is almost too terrible to contemplate. He also must break off the "understanding" with the woman he loves, Julia Oversley. Julia’s parents are much relieved but Julia takes it hard, insisting she wouldn’t mind being poor, although it’s obvious from her response that she doesn’t quite fathom what it would actual mean to be as poor as Lynton is about to become. His only hope, suggested by his man of business and by Julia’s father, is to marry an heiress. Although other men have done so and there’s no dishonor in such a course, Lynton is appalled by the suggestion. The heroine is, naturally, the heiress: Jenny Chawleigh. Motherless from a young age, Jenny was brought up by her large hearted but overbearingly middle class father, a man who puts a price tag on everything. He was devoted to his wife, who died in childbirth along with the son she was unable to provide him. Jenny is going to inherit a huge fortune. He and his wife always thought it would be nice if she were to one day have a title. Mr. Chawleigh is determined to buy her one. Despite Lynton’s initial reluctance, it does seem the practical solution since he can’t marry Julia. Jenny is short, plump, and plain, but she’s not a bad sort and she doesn’t expect him to love her. So they are married. The plot of the story follows the first year or so of their marriage as they get to know one another. It’s a gentle story. Woven into the background is Napoleon’s defeat, exile, escape, and re-defeat. Lynton, an ex-army man, is more interested in this than his society friends who find the goings-on in France more of a nuisance than anything else, but his concern adds depth to his character and nuance to the plot. Heyer’s gift for character development is what make her stories compelling. Lynton has to fall out of love with Julia before he can begin to appreciate Jenny. Julia is a great beauty but she is self-centered and histrionic. Other men (and women) recognize this about her long before Lynton does. Even when he begins to realize Julia might not have been the right woman for him, there is still a sense that a part of him will always love her. It’s annoying, but realistic. Jenny is sensible, pragmatic, and generous. (To a fault, almost. Only once does she break down and scold Lynton, who deserves it more often, and then she apologizes to him. To his credit, he recognizes his own shortcomings, but I’m not sure he quite understands how deeply he hurts her. Everyone always says Jenny is sensible but lacks sensibility. She doesn’t lack it, she just represses it well.) She loves Lynton from the start. Her patience and her ability to bend to accommodate him do, in the end, win his love. It may be an "old married friendship" kind of love rather than the passionate romantic type of love that she saw he felt for Julia, but she is content enough with that. As well she should be, yet it almost seems like she still feels she took second place. So, it’s a bit unusual for a Romance. The two people who should end up together do. They have their happily-ever-after ending. And yet, they don’t discover at the end that they actually are passionately in love. And that’s one of the reasons I love Georgette Heyer’s novels. Although well within the mold for Regency Romance, something a little poignant pops out that makes them memorable.